Visitation will be 5-8 pm Sunday, January 27, 2019 with Masonic Rites at 7 pm. 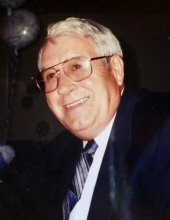 Graveside services will be 1:00 PM Monday at Bige Hoskins Cemetery in Clay County, KY with Rev. Bruce Alcorn officiating. Pallbearers will be, Erin Baker, Logan Baker, Megan Baker, Christopher Baker, Kyndon Goodwin, and Herman Baker. Honorary Pallbearers are, Johnny Jones, Darrell Harrison, Shell Benedict, and Charles Lee. To send flowers or a remembrance gift to the family of Homer Baker, please visit our Tribute Store. "Email Address" would like to share the life celebration of Homer Baker. Click on the "link" to go to share a favorite memory or leave a condolence message for the family.